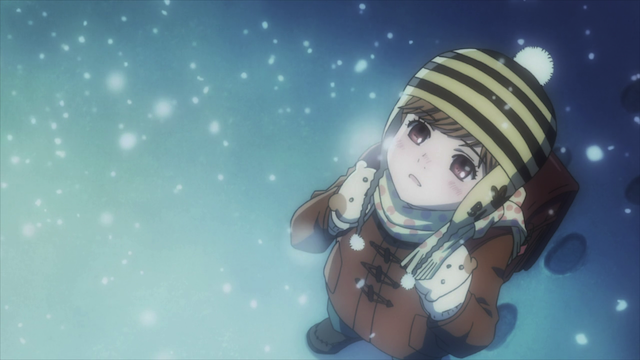 A young Chihaya Ayase in the falling snow. This weekend has been snowy and windy, so I spent a fair amount of time inside, and that means more time for anime. In part, this meant I finally had time to watch a series from 2008, called Kaiba. I also spent some time reading more blogs about anime. When I started this blog (back in 2010), I had thought I would try to incorporate a perspective that looked, in part, at anime as seen by the aniblogiverse. Basically, I thought it would be interesting to show what the reaction for a given episode was by incorporating comments from many other blogs. Recently I haven’t been very good at that, since I have tended to only check in on certain blogs. This weekend I took the time to look across many blogs to see what they had to say about Chihayafuru episode 6. This episode was Chihayafuru at its very best: creating an extremely tense situation in which anything could happen, which gets in everyone’s head, contrasting those whose minds are clear in such situations and those who may be over-thinking, showing characters figuring things out…or not, all while introducing yet another dimension of karuta. There seems to be a consensus around the aniblogisphere that this episode (or these episodes, including episode 5 and 6) are some of the finest episodes of any anime series to have aired lately. I certainly won’t disagree, although the quality of the competition is poor. IMO, Chihayafuru is (and has been from the first episode of episode 1) the best show to come out in the past couple of years. I have to marvel once again at Chihayafuru’s ability to turn seemingly minor characters into worthy subjects to build episodes around. Amakasu-kun was a throwaway character last season if ever there was one, but the message from Suetsugu – as is often the case with the best sports series – is that everyone has a story, even the people we pass by in life without so much as a second thought. It’s not just Amakasu. They managed to develop so many characters in interesting ways over the past two episodes. For example, Sumire’s decision to join the Shiranami society was yet another step that I could not have imagined when her character was first introduced. For Sumire, who believed she could get Taichi just like that and focus all her efforts on love and nothing else, she has come full circle, and seems to now be focused on learning how to play karuta by joining the society as well. I wouldn’t say that Sumire is a “great” character (at least not yet), but I am very impressed that she continues to grow, and we already have some other side characters that have become much more interesting than I ever thought they would become. Retro-kun, for one. He started out being an obnoxious twerp (way back in episode 3), but along the way he has shown his determination, and love for the sport, even if he hasn’t become an A-class player. In many ways, Chihayafuru makes losing just as important as winning, and – very realistically, might I add – uses it as a vehicle to push the development of the characters. At any rate, I’m glad that so many people are also enjoying this series. There are others who, I’m sure, would really like it, but won’t give it the chance it deserves. LOL, thanks for the plug. The international fraternity of Chihyafuru is a strong one. I’m glad that people have come to realize what a great show it is. It didn’t look like a lot of people were on-board while the first season was airing, but I think some people caught up with it in between seasons. I remember when the first season aired and all these people had negative things to say (including that Karuta wasn’t a real sport…) and I just didn’t understand! This is such a great show for so many reasons! I don’t know if there will be anymore seasons after this, but I’m glad it’s given people another chance to get into it – and hopefully enjoy it. Yeah. I really feel sorry for people who pass this one up. It truly is of exceptional quality.